Some end up their lives in the least assumed situations, some successfully live up to the mark if the luck backs them at the moment. We might have already watched tonnes of videos in which people escaped their deaths by milliseconds and millimetres. And here’s a mind blogging video of an old woman who was surprisingly saved by the concerned RPF sub-inspector and the fellow men out there. 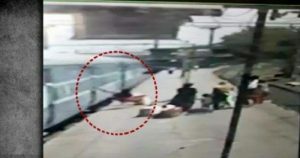 The incident occurred at Mumbai’s Kalyan district’s railway station when a 55-year-old woman Janabhai Lehane lost her footing while getting off the moving train and stuck in the gap between the train and the railway platform. The whole incident was captured on a CCTV camera that was placed in the related platform.